The magnificent, colorful beaks of toucans and hornbills might make you think they're related. Both bird types do keep their respective forest homes healthy and thriving. They have similar diets. But hornbills live in Africa and Asia. Toucans live in Central and South America. Their anatomical structures differ. And, although some hornbills beaks look similar to toucans', most hornbills have a distinctive beak feature called a casque. The beaks of toucans and hornbills are an example of what scientists call convergent evolution. Essentially, hornbills and toucans adapted to their different environments in the same way, developing similar traits. That makes them appear related. Bird beaks are made of keratin, a fibrous protein in hair and nails on humans, scales on reptiles and feathers on birds. 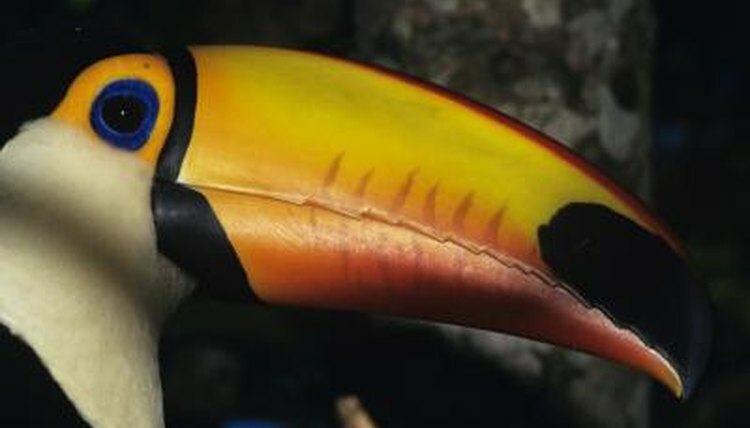 The toucan's beak might look heavy, but researcher Mark A. Meyers knows differently. “Our computer modeling shows that the beak is optimized to an amazing degree for high strength and very little weight,” said Meyers. The crushing strength of the hornbill beak is six times greater than that of the toucan, he said. The 54 identified species of hornbills make up the Bucerotidae family in the order Coraciformes. Many hornbills have a casque -- a bony growth -- on top of the beak. "Casque" comes from the French word for helmet; the growth has a helmetlike shape. To support the weight of the beak, hornbills have strong neck muscles; their first two neck vertebrae are fused. Males seal their mates into trees for a four-month nesting period. Toucans and their cousins, toucanets, barbets and aracaris, form the Ramphastidae family, in the order Piciformes. Piciformes also contains woodpeckers. Although toucans are essentially frugivorous -- fruit eaters -- they also dine on insects, small animals, and eggs of other birds. They spend most of their time in the canopy of the rain forest and nest in tree cavities. Toucan hatchlings are altricial -- naked and helpless. Toucans face predators such as boas, jaguars, eagles and hawks.